Download the Dalek Regular font for Mac or Windows in OpenType, TrueType or PostScript format. Bring some Dr Who to your mornings. The Dr Who Dalek 3D Projection Alarm Clock projects the time, date or seconds onto your wall (depending upon the mode you select). When the alarm sounds the time is projected. Time is displayed in 24hr or as am/pm. The clock features classic Dalek sound effects, bleating “exterminate” and making hover and gun sound effects. The clock base features an LCD screen. The base and time display glows in classic Dr Who blue. Requires 4 x AA (not included). H. Duffy A bit complicated My 8 yr old son wanted this for ages. He loves it and plays with it quite a bit... Not sure how much sleep he had the first few nights!!!. Has to be operated by an adult, as written Instructions are poor. I would say 8 yrs is about the right age to get to grips with things like the snooze feature. A little disappointed with the light display time special feature. Not very strong projection. P. M. Reynolds "emleymoor" Good alarm clock but seems a bit unstable This was a present for the elder of my two nephews. It went down well with him but also seemed very attractive to the younger one - and he managed to make it reset. However, I have heard no complaints since. The eye stalk seems a little bendy though. 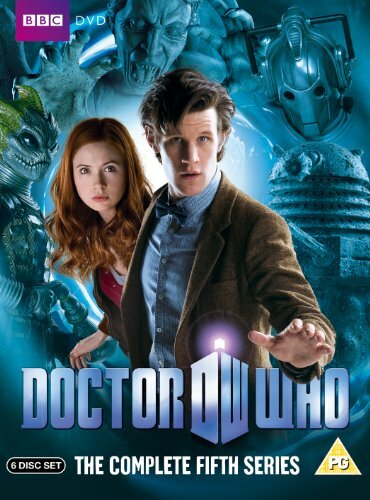 Can you stop the Dalek invasion from the Character Building Doctor Who Dalek Factory? 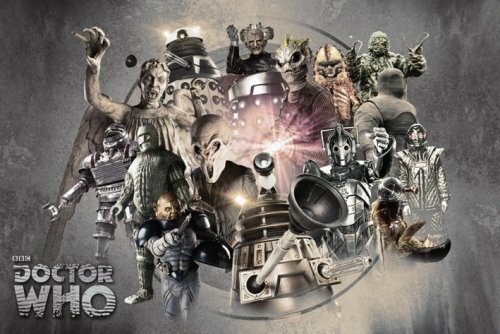 The Daleks are building their armies ready to return to Earth with one mission: EX-TER-MIN-ATE! Lift the Dalek warriors into place with the swivelling machine arm, then roll them down the moving conveyer belt and down the lift, ready to enter battle. 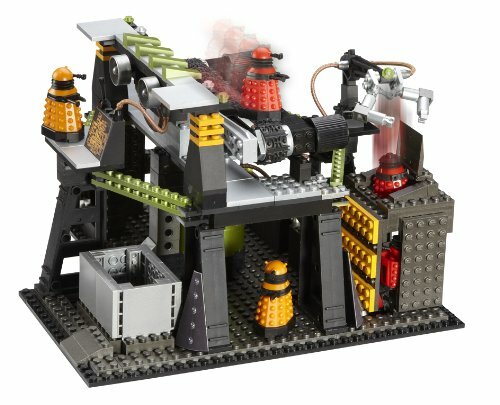 The Dalek Factory comes with two Dalek micro figures, a Dalek Scientist to monitor the army-building process, and a Dalek Drone to join the invasion. morpheusa5 "morpheusa5" Very flimsy and frustrating. No good at all for young children! This is a quite complex and very flimsy construction and literally falls apart as you are trying to build it. Complex and hard to understand instructions for my 7 year old, and it took me most of the day to build. Then it fell apart! No where near as good as Lego, this is a poorly made copy that has bad build quality. The conveyor belt falls apart as you are building it and unless I have mis understood the instructions, does not appear to move properly anyway. I am considering super glueing this all together because it's quite useless otherwise. Also at least one of the Daleks does not stay completed - it keeps coming apart. Badly constructed and full of flaws. Avoid at all costs! How the BBC endorses this I don't know! Darren Millar Scared to play with it! Bought this for my Son for Christmas as he asked for it. He was so excited when he opened it. The building of it took a while and I don't really think an 8 year old would have been able to do it on their own so I did most of it. After finishing it, my Son played with it for about 15 minutes but got frustrated when bits kept falling off. I know it's made of 'lego' and is therefore not solid but you only need to brush past something and it drops off, also the conveyor belt is really not very good as nothing stops on it. On the plus side it is a very impressive looking structure when build but it is meant to be played with not just looked at. Unfortunately my Son is almost afraid to touch it now in case something breaks. Many years ago, the Daleks sent out thousands of egg-shaped Progenitors containing the genetic coding of the race, so that new Daleks could be created whenever necessary. One of these Progenitors was found in war-torn England during the Second World War and transported to a Dalek ship. However, because the Daleks that found it had been genetically modified by their creator Davros, using his own DNA, the Progenitor did not acknowledge them as pure Daleks, until the Doctor identified them as such and the Progenitor created a new race of powerful Daleks as a result. These Daleks were led by the white-cased Supreme, and include the enigmatically titled yellow-cased Eternal, blue-cased Strategists, orange-cased Scientists and the red-cased Drones. Collect all five of the supreme beings. 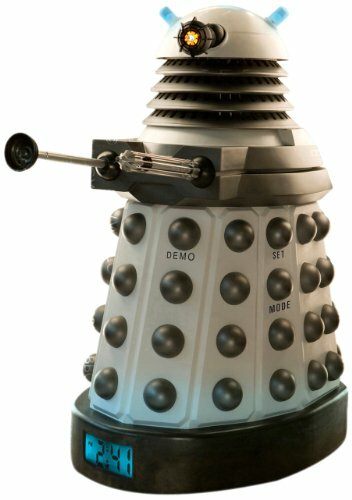 Detailed 6-inch scale Dalek action figures. P. Lythall "Shockwave515" Great addition! Really glad I got this figure to add to my ever growing collection of doctor who figures, eternal really makes a good addition to the collection. It came on time, nicely packaged and easy to open up, the figure itself was and still is in excellent condition.all in all I give this figure 5 stars all the way. 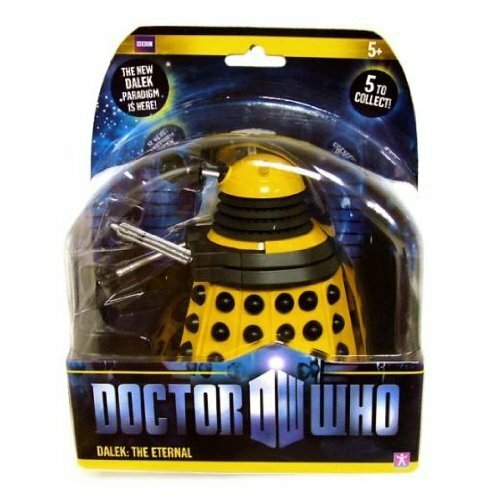 When you need everyone in the universe exterminated, reach for the Character Building Doctor Who Dalek Army Builder Pack. 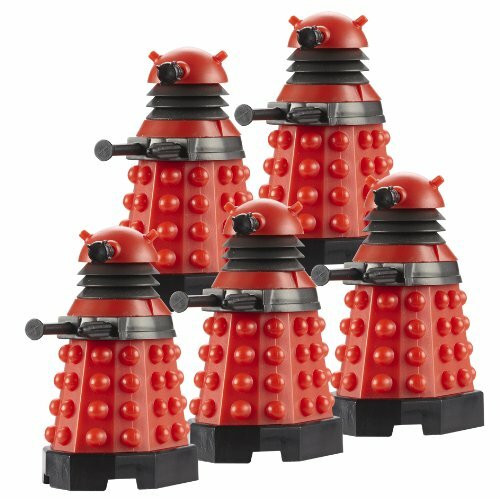 Use these five Drone Dalek micro-figures to stage battles with your other Doctor Who Character Building figures. 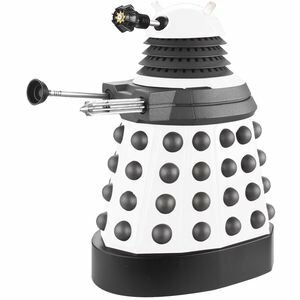 Each Dalek has a rotating head and a display base. 5 inch Supreme Dalek. These Daleks were led by the white-cased Supreme, and include the enigmatically titled yellow-cased Eternal, blue-cased Strategists, orange-cased Scientists and the red-cased Drones. Collect all five of the supreme beings. Reginald white dalek Good prompted service and delivery. My grandson enjoyed it tremendously, this one made his set complete. I look forward to the next one.